It was a necessary evil I played basketball in high school. I loved the sport but I knew my future ambitions lay elsewhere. In the words of my beloved Coach John Royal: “It’s a good thing you’re an honor student, Reid!” The suicide drills and conditioning runs turned giggly teenage girls into a team that sweated together and trusted each other and pushed their impossibly young bodies to be stronger. I understood the goal even if I detested the running part. Since I was vaguely an athlete, I was asked to try out for the cross-country team. That lone, miserable mile in the blazing Florida heat was the last time I’d run on my own accord for nearly 10 years. As I approached my 30thbirthday, I decided it would be a good idea to run a 5K. No matter that I’d never managed to run more than a mile or two on a treadmill since that brutal day a decade before. In a slight panic, I noticed a new running group at the running store in my neighborhood. Billed as a “Chicks Run,” they promised a 3-5 mile low-pressure run with time for socializing with wine afterward. That night I ran four miles as I chatted with a new friend and chugged along the lakefront trail. I was hooked. The group of women I met there grew to be my closest friends. We ran races on weekends, met up at the weekly group run, went to bars, became roommates. My sister moved to town and she joined us, too, much to my delight. At that time in our lives we were gloriously self-indulgent. We ran, drank coffee for hours, and followed that up with brunch and cocktails. It was magical. And the running united us. Then life and fate took me away from my beloved Chicago to rural Michigan. I escaped to run along the remote roads whenever I could. As in most things when I was there, nobody understood what I was doing. Once I was out for a run and a car pulled up beside me. The driver rolled down his window and called, “Do you need a ride?” “No,” I said, shaking my head, “I’m running.” “Suit yourself,” he said, shrugging, and drove away, leaving me to finish the last few miles of my run. During that brief, unhappy time, the solitude of these runs served as my therapy sessions. I worked through choices I needed to make, running with only my thoughts to keep me company. The miles I logged on those country roads helped me realize what I needed to do. After I returned to Chicago, my sister and my running friends were there for me. So was running. Then it was about getting through this transition: From who I was before I left to who I was now, and who I would be next. When I met and married my husband, I was ready to embrace a new chapter. New races, new challenges, and a new partner who supported and encouraged me in all that I wanted to do. I ran a half marathon through Central Park in New York with my dearest friend. I ran in Paris under the Eiffel Tower and over the Seine. I ran along the Mediterranean Sea in a medieval town on our honeymoon in Spain. I completed two triathlons, despite my inexperience in open water swimming. He always asked me, “Did you win your race?” I would laugh and say, of course I did. I ran fearlessly toward my new life. 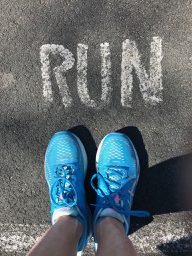 I ran until just a few weeks before our first son was born. And a few months later, I ran with him in the jogging stroller that was a gift from my running friends. I was grateful. A few years after that, when his brother arrived, I ran with him, too. Our sunrise outings helped us both – a few more minutes of sleep for my early rising baby and some fresh air for me. And I was running again, with new partners and priorities. These days my two young boys run everywhere and I jog along behind as best I can. Recently they did a kids’ race that’s part of my favorite neighborhood 5K. They did their dash with reckless joy and abandon – arms and legs churning as fast as they could as they barreled down the 100 yard course toward me. They grinned as they ran and I embraced them as they crashed over the finish line into my arms. We walked home wearing our race numbers, holding hands. They admired their medals and asked, “Did you win your race, too, Mama?” Their faces, proud and shining glowed with joy and health in the morning light. This essay originally appeared in Fete Lifestyle Magazine, May 2018.